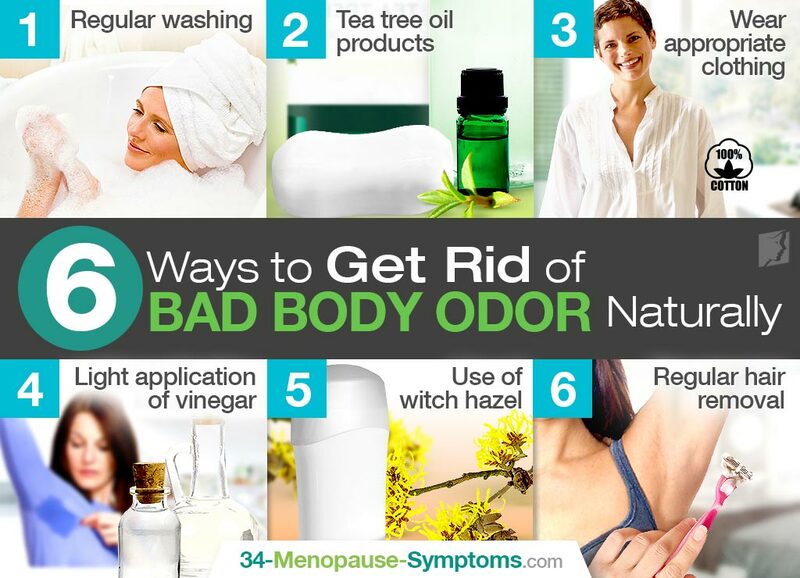 Unpleasant body odor can affect all women, but it is particularly likely to become a problem for women during their menopausal years. It occurs due to an increased production of sweat in this phase of life, often triggered by other menopausal symptoms, such as hot flashes or night sweats. If you are faced with this unfortunate condition, you might be desperate to find alternative ways to alleviate it. If so, read on to discover six most effective ways to get rid of bad body odor naturally once and for all. Body odor happens as a result of the presence of bacteria in sweat. Therefore, it will come as no surprise that washing such bacteria off will significantly reduce the intensity of this unpleasant problem. Depending on your personal hygiene, daily schedule, and weather conditions, it advisable to take a shower or bath at least once a day. Using antibacterial soap will provide additional benefits. Scientific research has shown that tea tree oil possesses antifungal and antimicrobial properties, which can be very useful in combating bacteria that thrive in sweat. There are a great number of toiletry products out there, which contain tea tree oil. Alternatively, it is quite easy to make body washes and bar soaps at home using this essential oil. If you are prone to excessive sweating, it is recommended to wear loose-fitting clothing that is made of breathable materials that allow sweat to evaporate quickly. Natural fabrics, such as cotton, silk, and wool, are suitable for day-to-day use, while synthetic fabrics are often used in the production of athletic wear due to their ability to absorb sweat and prevent it from accumulating on the skin and leading to bacterial growth. The idea of putting vinegar on your body might seem strange and unappealing, but spritzing a small amount can make a considerable difference in relieving bad body odor. Vinegar is well-known as an efficient, antibacterial cleaner, which is safe on the skin and can be an invaluable for eliminating smelly sweat from the skin. This natural product is sourced from a small shrub, and it is revered by advocates of natural health for its many uses. It too has antibacterial properties and can be found among the ingredients of many organic deodorants. Its fresh, unique scent is another attractive feature for sufferers of bad body odor. For women with bad body odor, it is advisable to partake in regular hair removal as hair can obstruct sweat glands and inhibit sweat from evaporating completely. The longer sweat is left on the skin, the more likely it is to contribute to bacterial growth. The frequency with which you shave will depend on your personal preference and rate of hair growth. Bad body odor can be a troublesome problem, capable of causing embarrassment, reducing your self-esteem, and limiting your social life. Fortunately, with diligence and good habits, its occurrence can be greatly minimized. If you still struggle with bad body odor, check out the most useful treatment options to make this condition a thing from the past.